One of the most exciting stages for little ones is when they start having solid food at the dinner table. But let's face it, things can get pretty messy! Nuby's Sure Grip Miracle Mat Section Plate makes this transition easier by combining a plate and placemat all in one easy to clean piece. And even better, this plate grows with your child so they can enjoy it for years to come. Design | The Nuby Miracle Mat Plate features two sections and grips to tables and highchairs, keeping it securely in place during mealtime. The 100% silicone material makes for easy clean up because there are no edges or spaces for food to get trapped. You can either wash the plate by hand or put it in the dishwasher. Colors | The Nuby Sure Grip Miracle Mat Section Plate comes in fun colors like blue, red and aqua (pictured). These gender neutral colors make mealtime fun, colorful and easy to tell meals apart... especially if you're dealing with twins! I loved the aqua plate so much I picked up a red one as well so both our twins can enjoy them! Longevity | While I definitely intend on using these plates for our twins, my three year old has been loving them in the meantime. She loves the colors and how her food is in separate sections. It's great if you're dealing with dips or softer foods like fruit cups so the food doesn't "mingle." We'll be enjoying these plates for a long time! 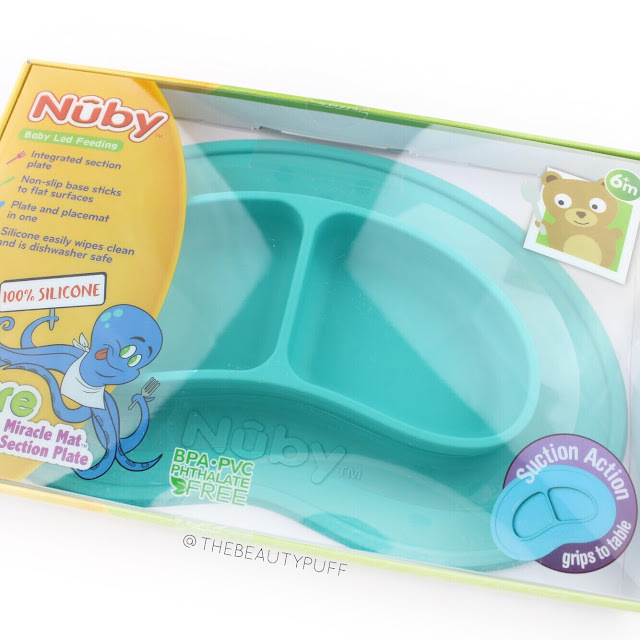 You can find the Nuby Sure Grip Miracle Mat Section Plate below on Walmart.com.